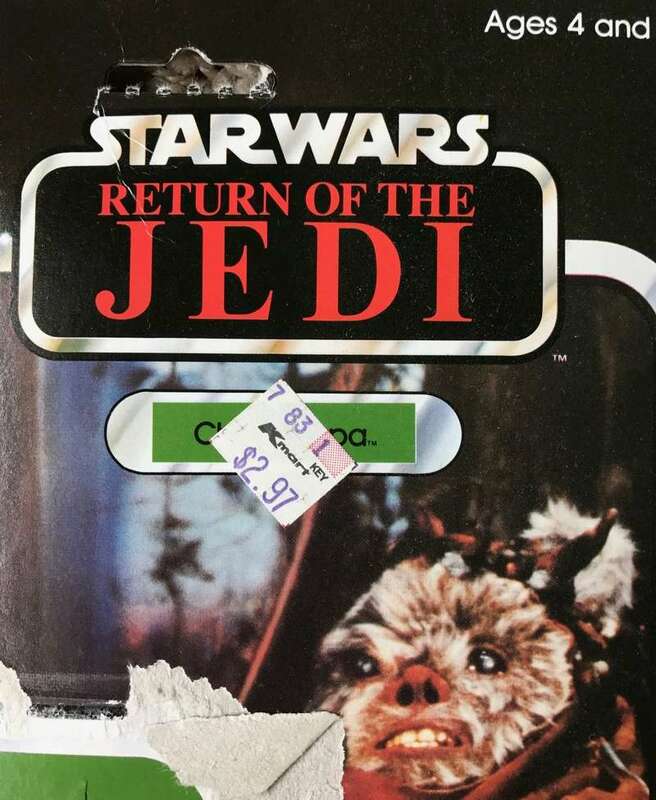 This topic was created so that we could have a Gallery to post photos of Star Wars packaging with price stickers from stores that were around back in the day. 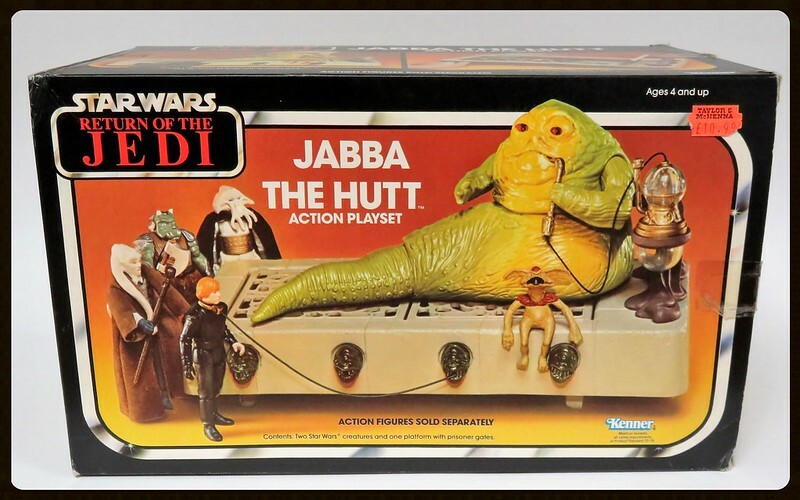 I will start off with my ROTJ Greedo... 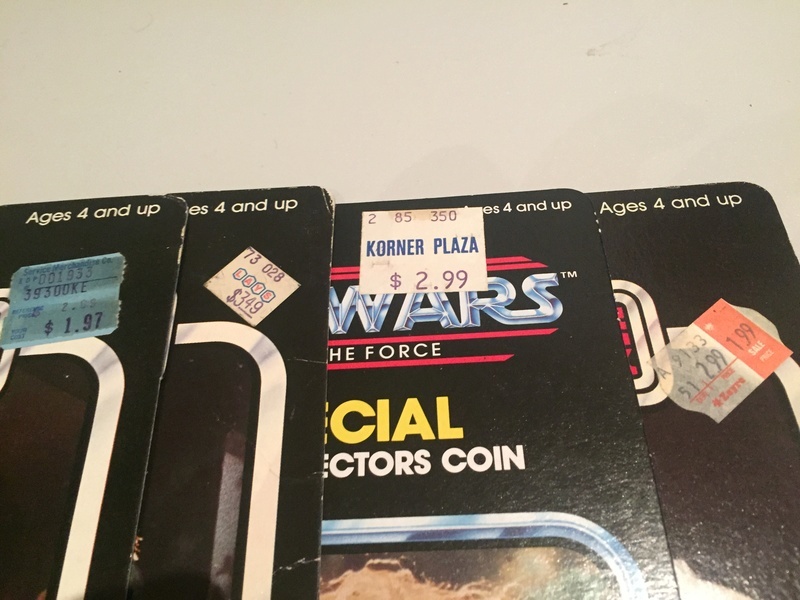 I hope many of you will join me in contributing to this "Gallery of Price Stickers"... 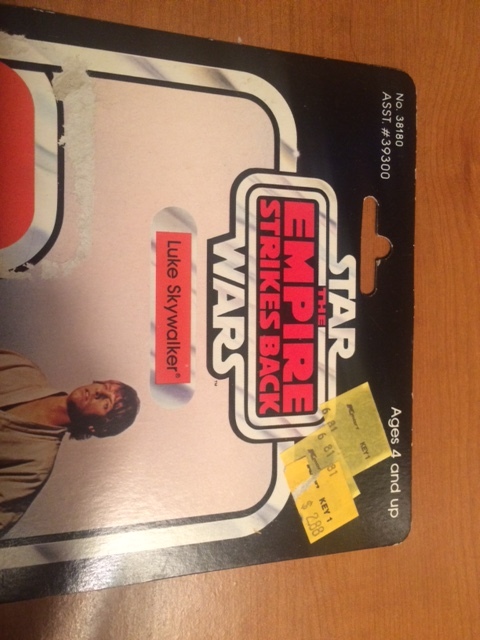 The packaging state or condition does not matter, we want to see the price stickers... Thanks in advance, and enjoy! 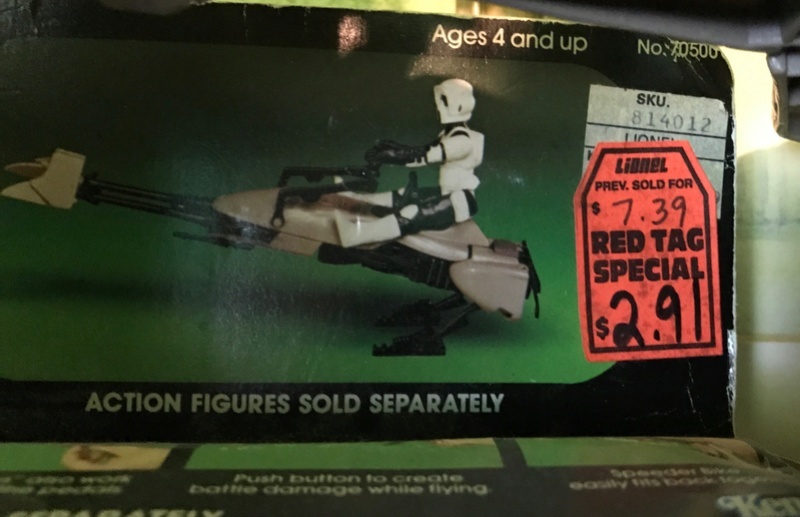 And here is my last set of photos until I can snap some more pics... A factory sealed Speeder Bike with two Child World stickers... Unfortunately, the big yellow sticker fell right off while I was taking this photo. It was already really dry and hanging by a thread... 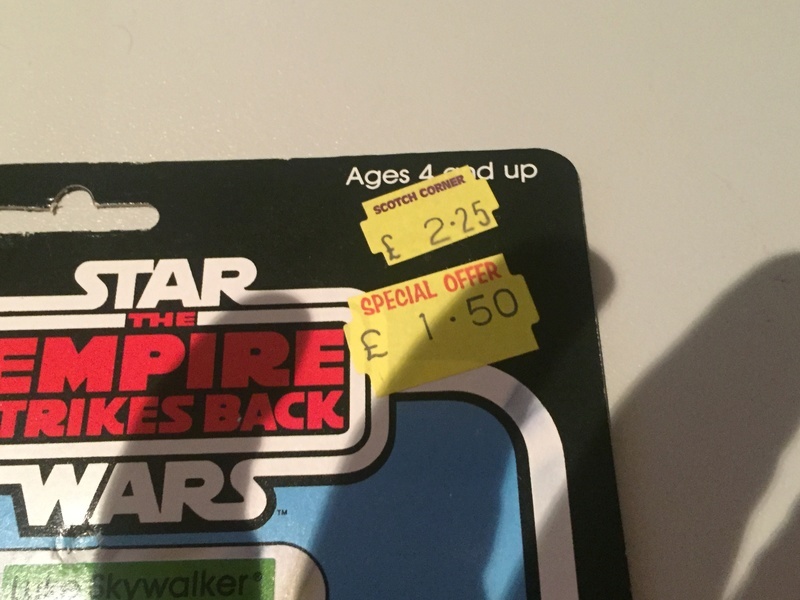 Still can't believe some of these clearance prices! Hellhippie, I had no idea... Thanks so much for letting me know! Good idea on a thread. Hopefully it gets lots of additions. I don't have many moc figure. I did a free drawing this last week for one of a few i do have. That one has a Toys r us sticker but it is only half way hanging on. 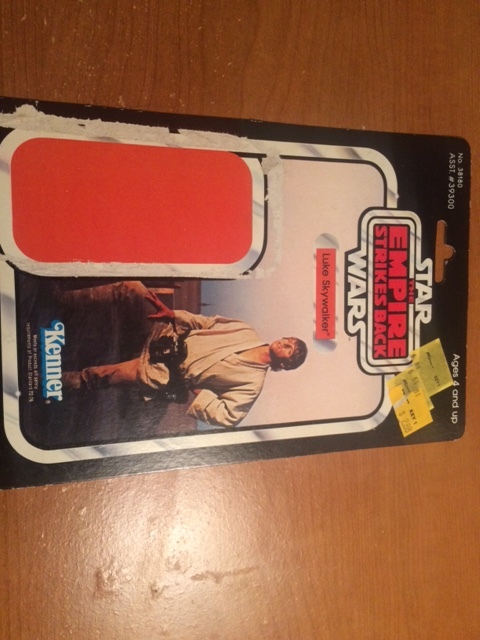 It may not even be in the original location if it came off in the star case and landed in another spot on the card. As I don't remember it being on the bubble when I bought it, but it's been ages so cant honestly recall. Thanks Trapped Texan! I really hope other members enjoy it and add to it. I would love to see price stickers from all over the US and from the rest of the world too. The only MoC's I have are in the last image, I'm a loose collector mainly, but I do have plenty of boxed vehicles, so here are some of my price stickers. 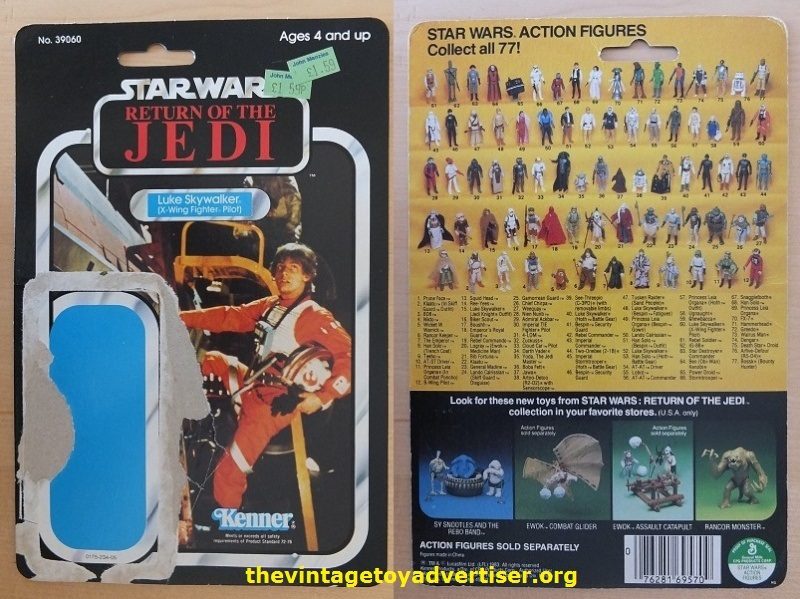 Also, being a Brit living in the USA and the fact that most of my collection is Kenner, not Palitoy, I'm not at all familiar with the store names so hope they mean more to you guys! Great thread with some cool stickers so far. 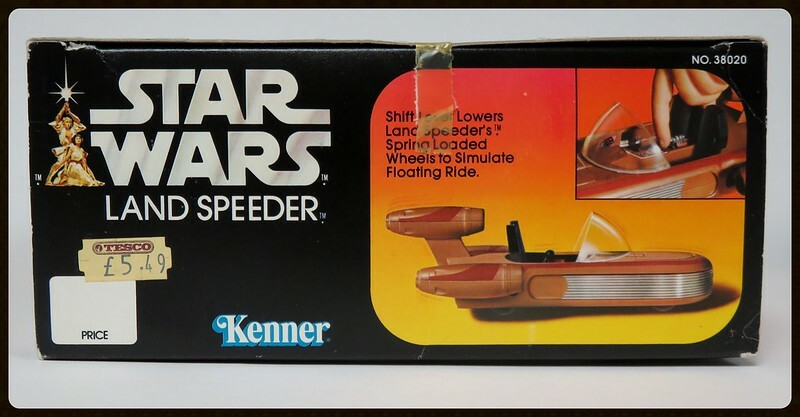 I love the Lionel Red Tag Special on the Speederbike. 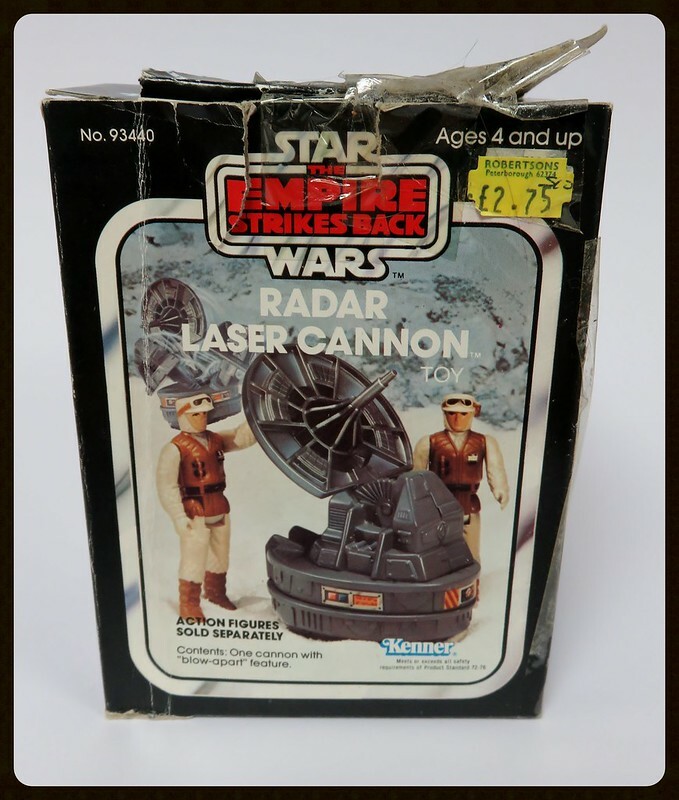 Lionel traditionally made model train sets (including the Star wars Duel at Death Star racing set with Vader and X-Wing vehicles), but I didn't know that Lionel also had their own toy stores, and at one point was the 2nd biggest toy retailer in the US. 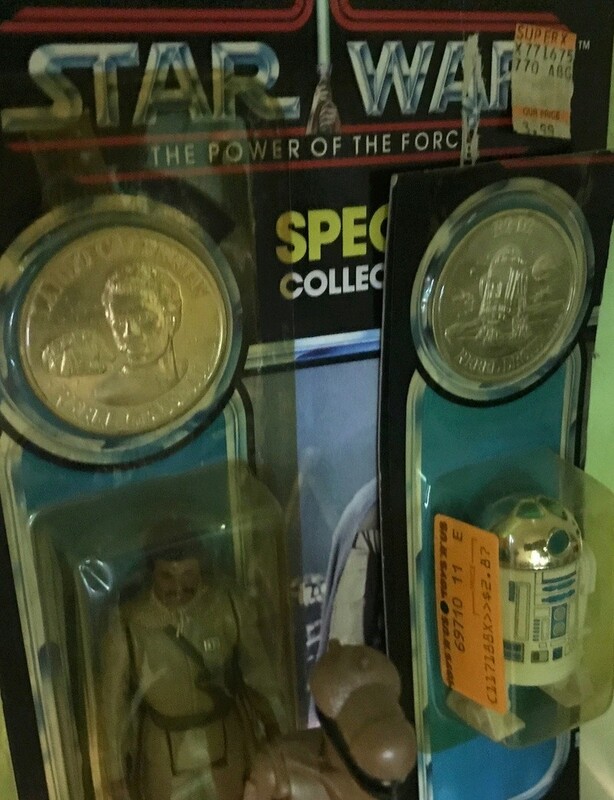 Also like that R2-D2 POTF moc with the TRU sticker attached to the side of the bubble. Don't think I've seen a sticker put in that position before? Here are a few of my stickered items I have at hand. Have some others and will try and grab pics to add to this thread. 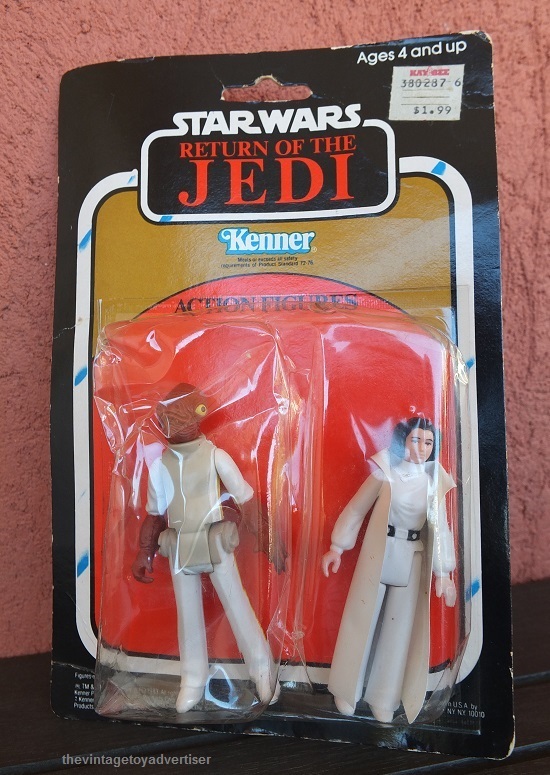 ROTJ Two Pack, Ackbar and Leia. 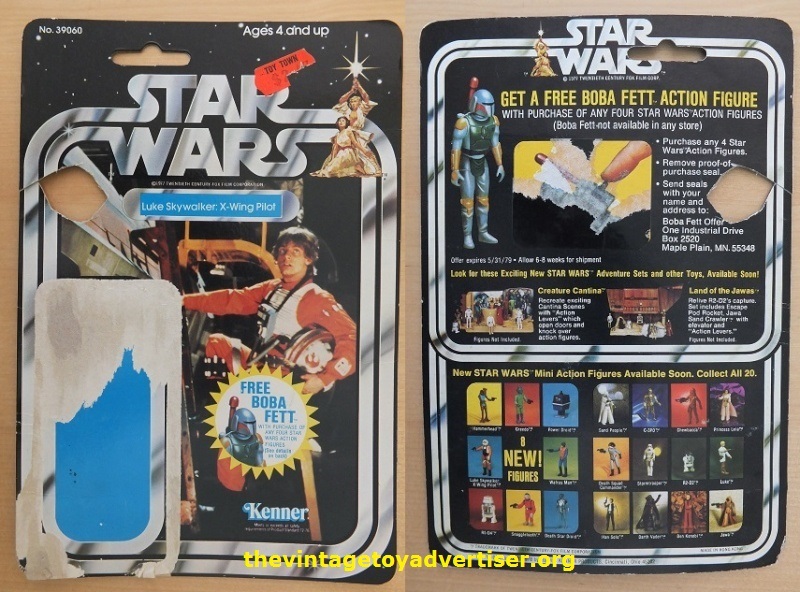 SW Kenner 20b Free Boba Fett. 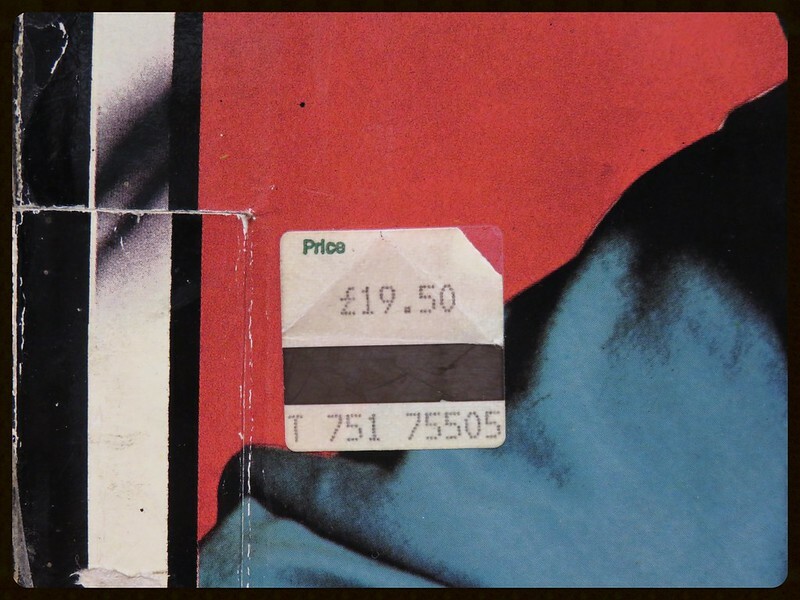 John Menzies (UK) price stickers. Wow, I just love all the photos you guys posted!! 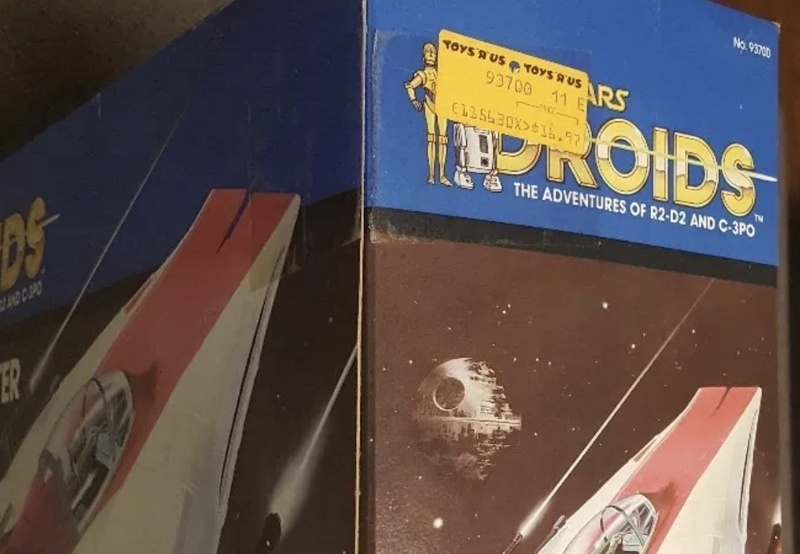 I agree with Artoo_Detour, I don't think I've seen a price sticker on the side of the bubble like before either... that's a great display piece! 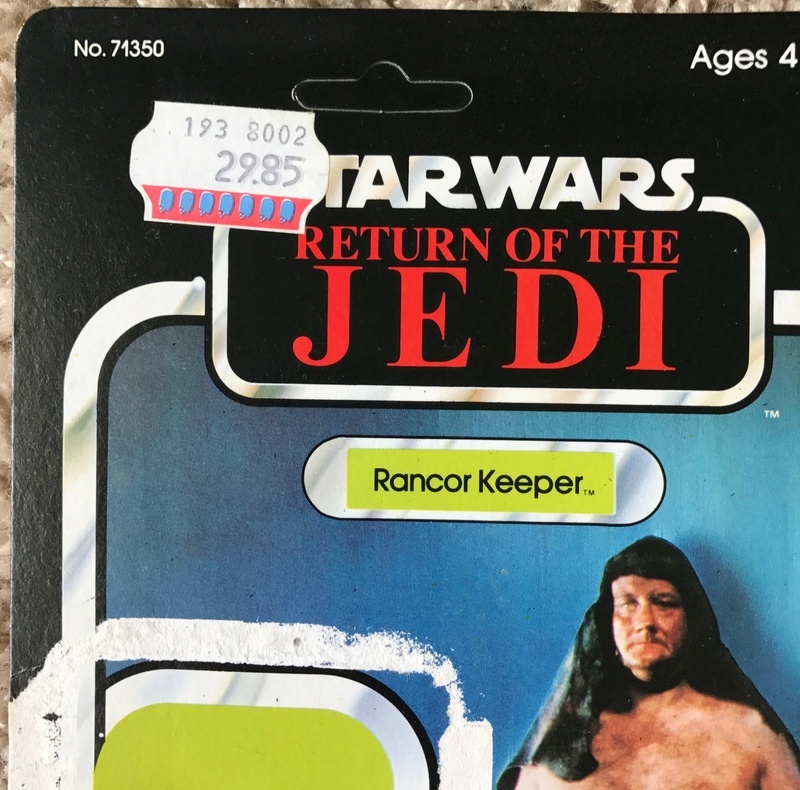 Artoo_Detour, I love the John Menzies price sticker! 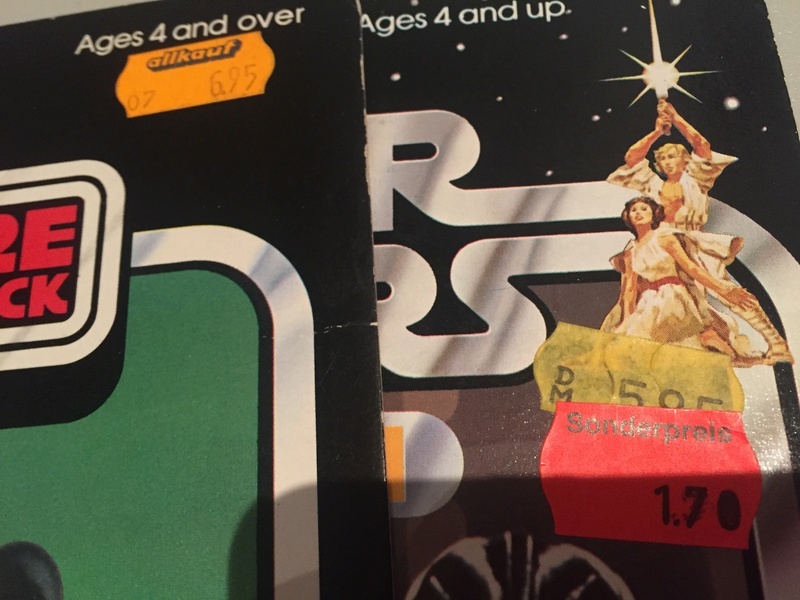 Some of my favorite price stickers are my favorites because of their color, and I love that mint green color that the Menzies sticker has... 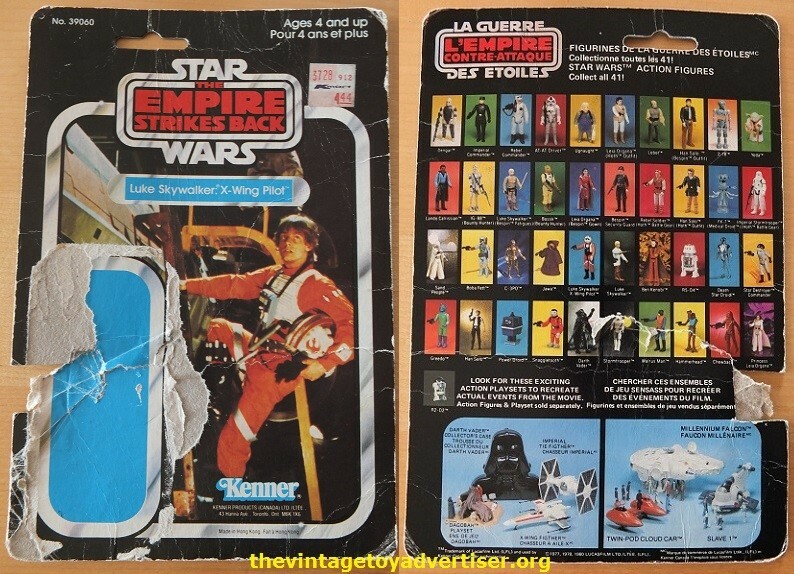 I also love the set of X-Wing Luke cardbacks, and the Ackbar/Leia double pack!! 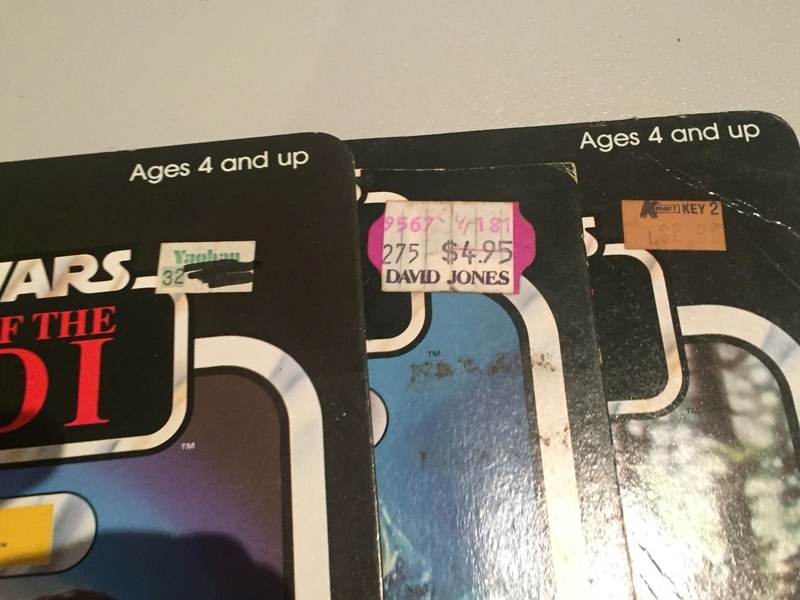 I love the price stickers... I'll sift through the collection and add to this thread where I can. Thanks Mike_Z, looking forward to the photos! Ah yes I have a Lionel train, didn't make the link at all. 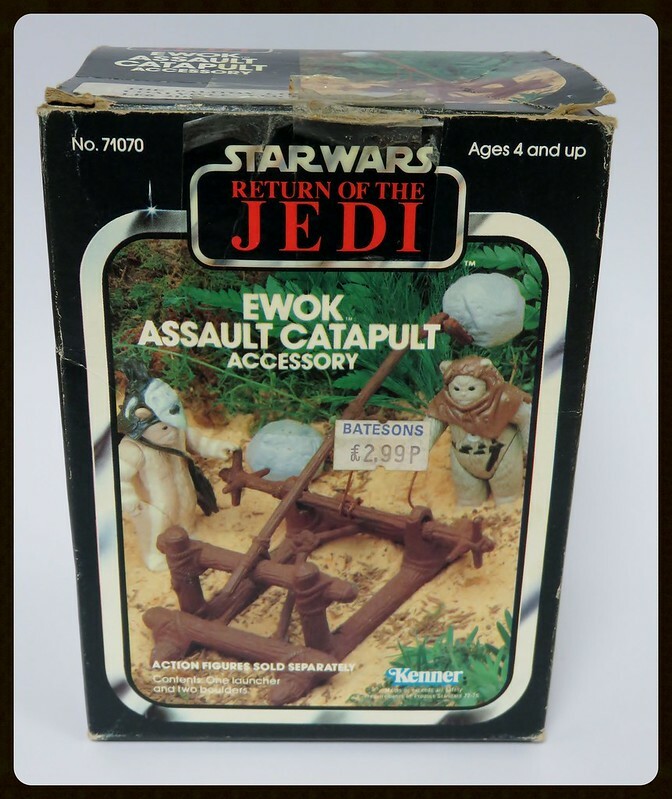 It's funny, i found that speeder bike literally in a junk pile, it's complete and working but the box is a bit beaten up. Ah yes, John Menzies, that's my neck of the woods, we had one in the village we grew up in - think they're still around. I didn't think to look through my cardbacks last night, so here's some more, including a couple from the Netherlands! These stickers are wonderful! 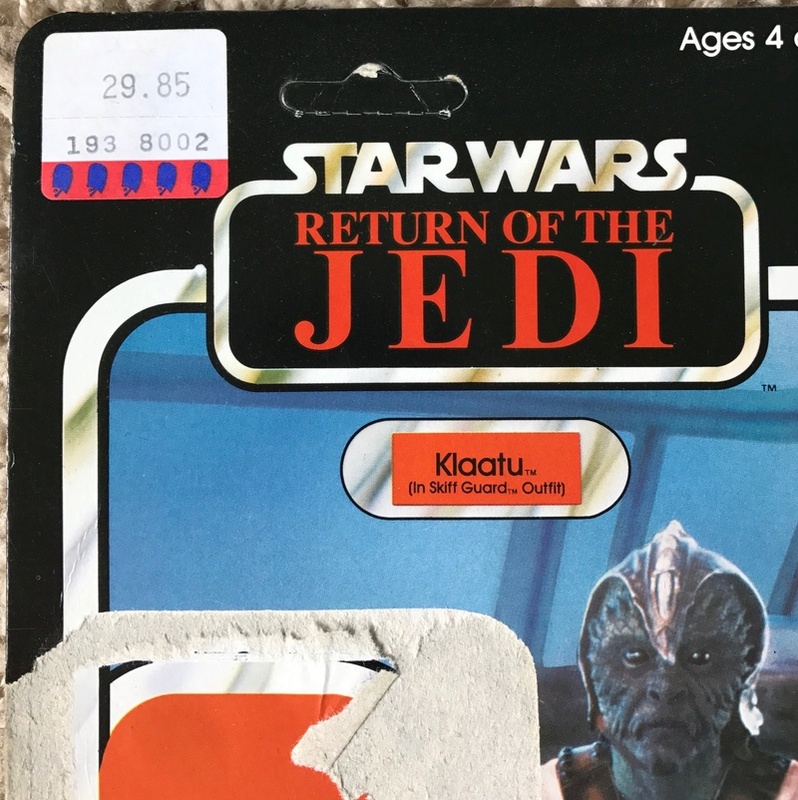 I have never seen the ones on 8D8, Rancor Keeper, and Klaatu Skiff... By the way, what is the blue symbol in the sticker on Rancor Keeper/Klaatu Skiff? It looks like a British Guard? am I nuts, its hard to see? 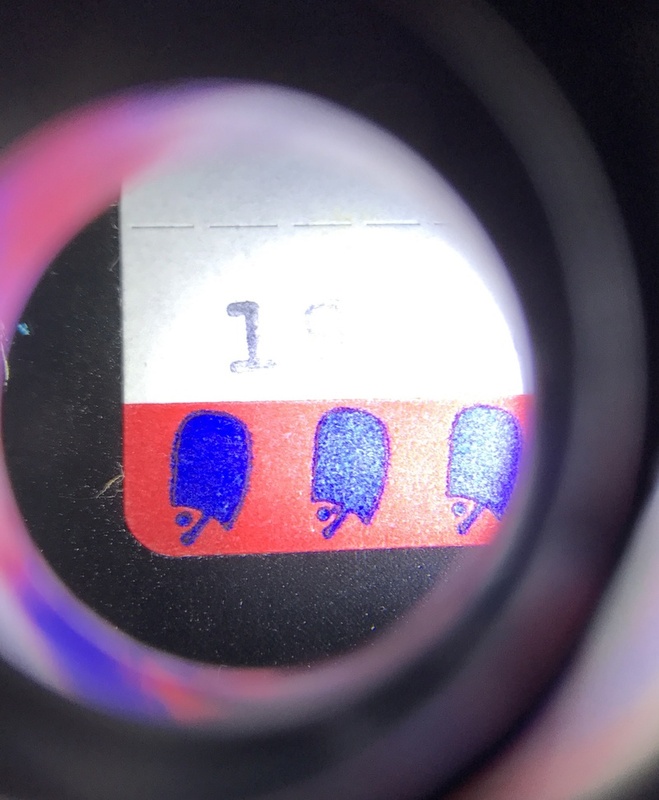 Here's a close-up of the symbol. All three of those cards (Rancor, 8d8 & klaatu) came from Denmark but i don't know what the symbol is or the store name. Here's a close-up of the symbol. All three of those cards (Rancor, 8d8 & klaatu) came from the Netherlands but i dont know what the symbol is or the store name. 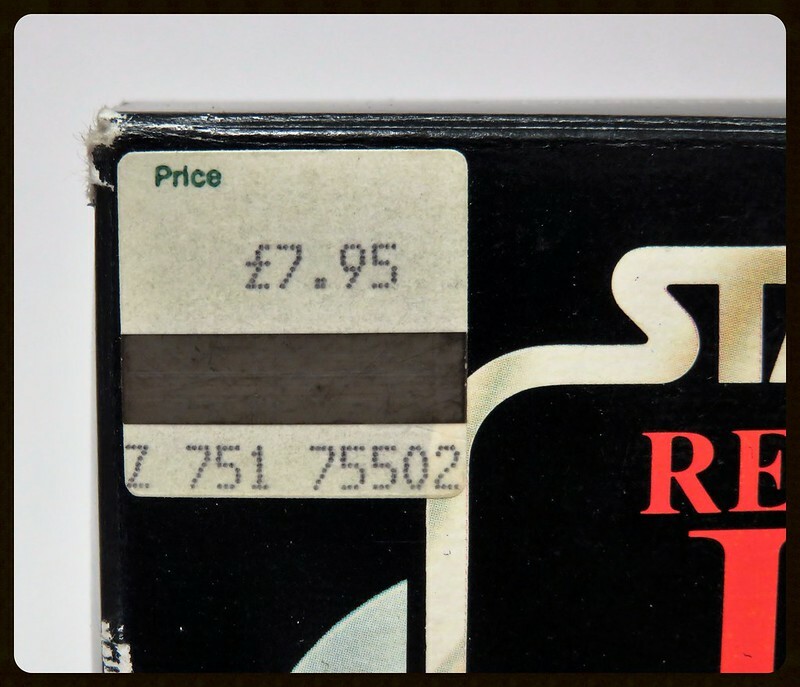 Wow, that is the craziest price sticker I think I have ever seen... Thank you so much for the close up pic I really appreciate it... What a great sticker! I really can't figure it out, but I love the colors and the symbol... whatever it is, its cool as hell! 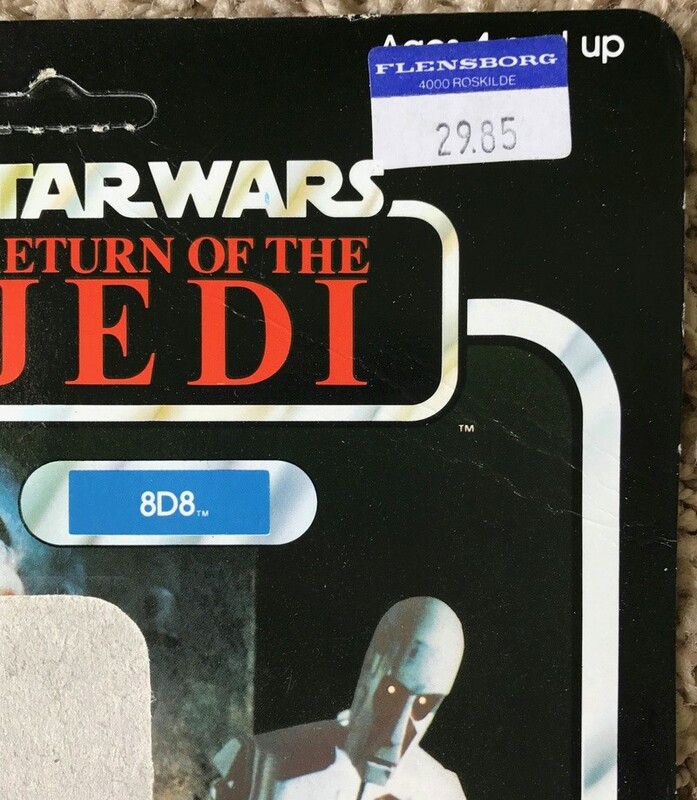 The sticker is Danish and comes from the Danish toy store chain BR, which still exists today and serves a number of Nordic countries but likely back in the day it may have come from a Denmark store, purchased by a parent travelling or holidaying, or was moved to a BR store in the Netherlands if they had stores located there back then. 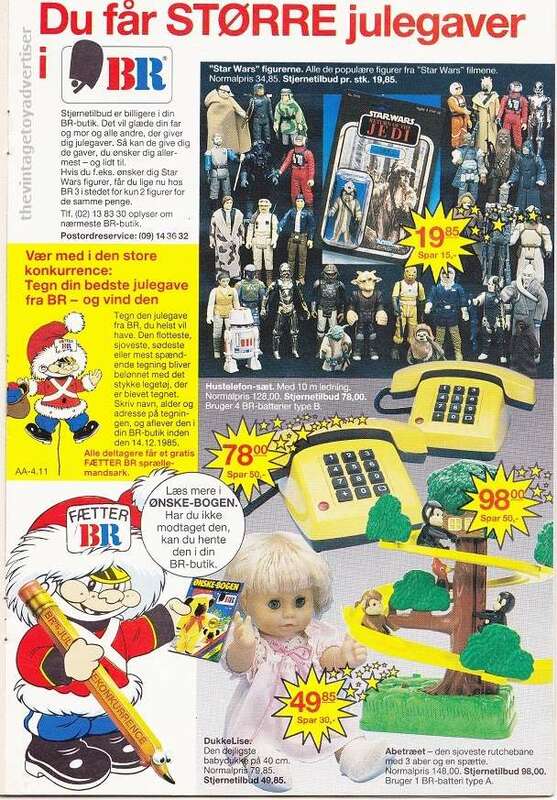 Here is one of my ads from Denmark showing some SW toys from BR. Those are some dynamite pieces you just posted photos of... 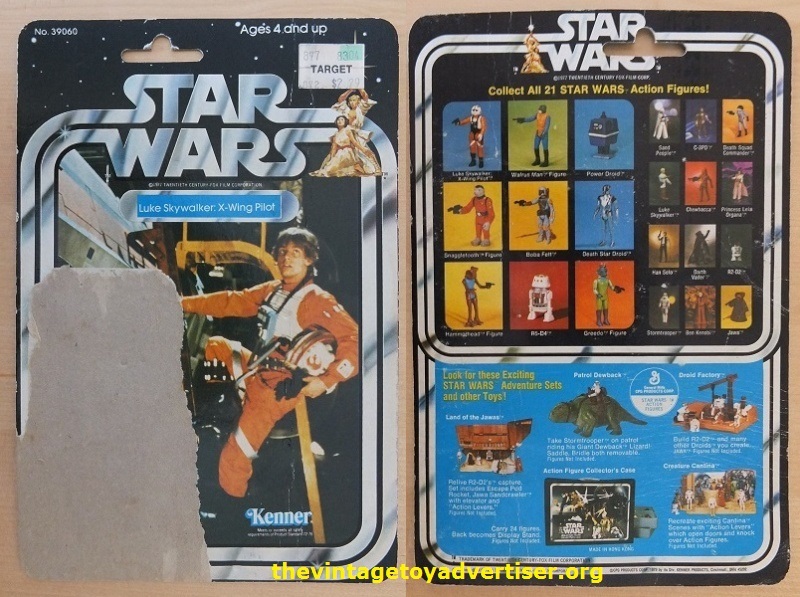 The Tesco sticker is my favorite, and the Landspeeder and Jabba are stunning!! Thanks for sharing! Thanks so much for posting this! I have never seen this Danish stuff before... I am really enjoying all the great stuff that people have been posting... Love the over seas stuff! I'll dig Singaporean ones out latter. 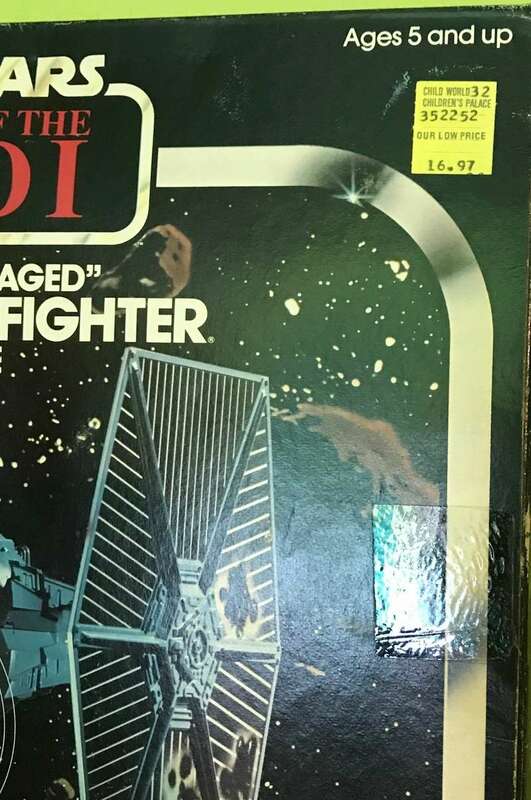 Wow you guys, I am in vintage price sticker heaven!! Can't believe all the different stickers from all over the world! 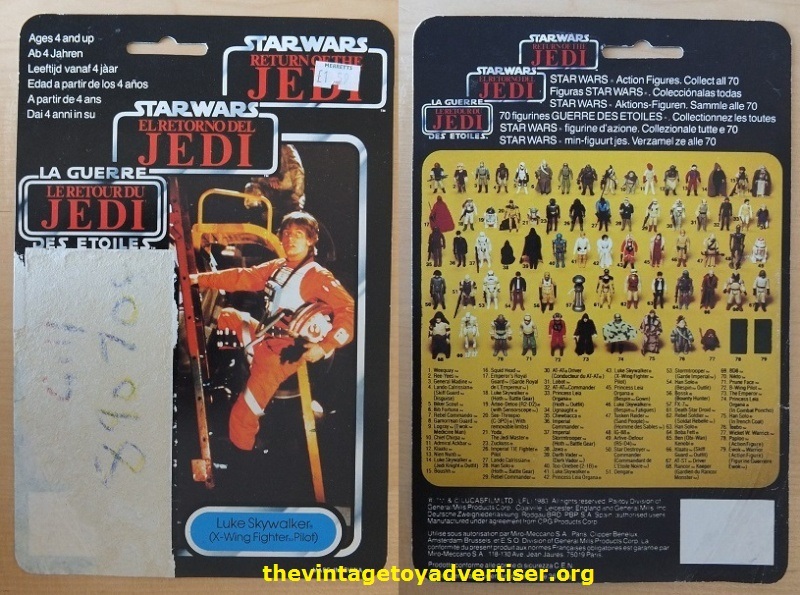 Aussie, that Jedi Luke with the yellow and red Coles sticker is really awesome, dont think I have ever seen one like it. 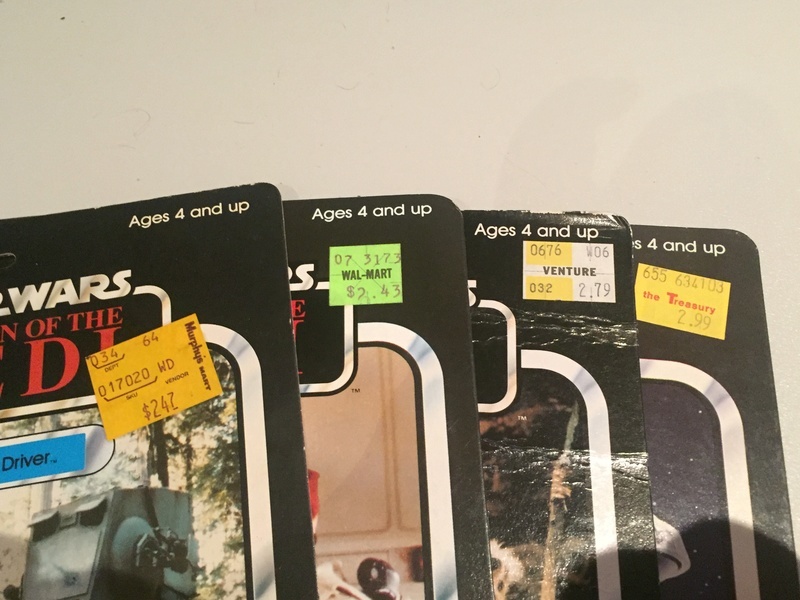 I love how some of the more colorful stickers look against the black background of the vintage cards, I can't wait to see the Singapore stickers! I can't thank everyone enough for sharing all these wonderful price stickers... I am a huge fan of color, and I still remember how amazing it was to walk into a toy store aisle back in the late 70's & early 80's... There are so many cool stickers in here already, I am wondering if we should have set up sub-categories by Country, lol!